Swollen, bleeding, and tender gums are just some of the signs of periodontal, or gum, disease. If left untreated, these symptoms can progress into tooth decay and tooth loss. The good news is that most cases of periodontal disease can be reversed with professional dental deep cleanings and good follow up hygiene at home. 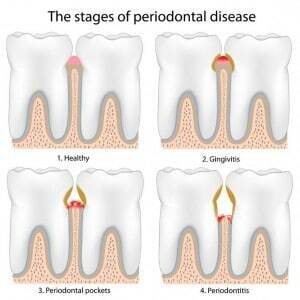 If you have been diagnosed with periodontal disease do not delay treatment. If you are experiencing inflamed gums, gingivitis, or any suspicious dental symptoms, please call our office to set up an appointment as soon as possible. Dental deep cleanings are recommended for early to mid-stage periodontal disease. While early periodontal disease can be diagnosed based on observing the gum line, the most accurate form of diagnosis is when the dentist or hygienist, using a special instrument, probes between the gum and teeth. Probe depths up to 3mm are considered normal, depths of 5mm or more are considered to be indicative of periodontal disease. If your dentist observes periodontal disease, they will recommend that a deep cleaning be done as soon as possible. The goal of dental deep cleanings is to remove the bacteria and debris that is causing the pocketing and inflammation so that the gums can return to normal. 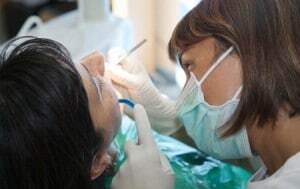 This involves scaling and root planning; your dentist or hygienist carefully working to remove bacteria, plague and tartar from the gum pockets, surrounding tissue, teeth, and roots. You may be required to take an antibiotic to assist in the healing process. Your dentist will need to see you back for a follow up appointment to make sure that the gums are healing and returning to normal. After that, most patients can return to a 6-month cleaning and check-up schedule. However, it’s important to have your dentist evaluate the best schedule for you. It’s also important to practice good daily oral hygiene (brushing, flossing, and mouth wash) to help your gums and teeth stay healthy.